So, I've been wanting to try my hand at this recipe for a while. I’d been a little nervous about it because I really wasn't sure if it would work. I was pretty sure it would taste good but I literally didn't know if it would work…. as in, if the cookies would firm up right. That’s the thing with this food blogging gig… sometimes I try stuff and I don’t love it. For every ten recipes that make it here on the blog, there’s one or two that I don’t love enough to cook again. That’s my criteria, by the way... if I wouldn't bother to cook it again, I don’t publish it on the blog. 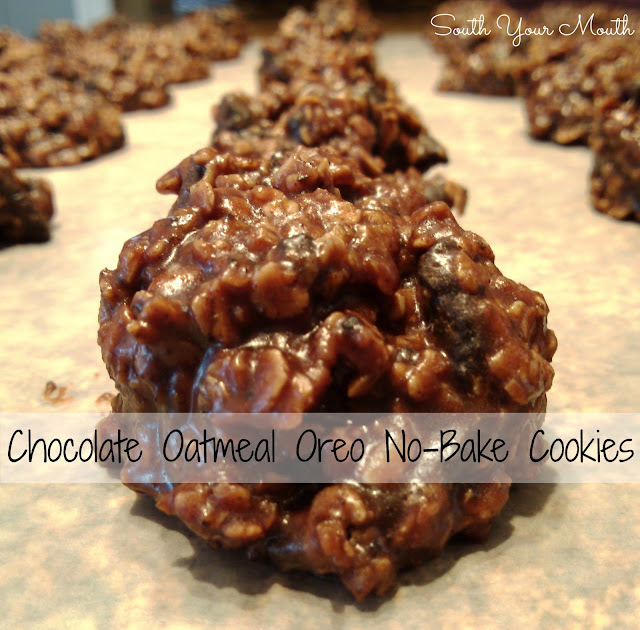 IN EE WAAAY… my other no-bake cookies have peanut butter in them. I didn't want peanut butter in these and decided that if I used double-stuffed Oreos, the cream would serve the same purpose as the peanut butter. I hoped. So, I whipped up a batch, spooned them out, said a little prayer and hoped for the best. And guess what? They’re amazeballs!!! Place Oreo cookies in a gallon-sized zip-top bag and crush with a mallet or rolling pin; set aside. In a large saucepan bring to a boil the sugar, salt, cocoa, butter and milk. Boil mixture over medium heat for 1 full minute. Remove from heat immediately. Add oatmeal and crushed Oreos then stir until thoroughly incorporated. On a sheet of waxed paper, drop mixture by the teaspoonful. Cool until set and firm. This may just be good enough to try! Yum! I think it's hilarious that right under the "printable recipe" link is the "1 Rule of a flat stomach" ad....hahaha These look delicious.. yum.